We distribute tools, seeds, seedlings and give practical training workshops to teach the Pygmies how and when the different plants are treated. Plants grow fast in this tropical climate; tomatoes mature in 6 weeks, cabbage in 8 weeks. The harvest provides food to fulfil their own need and the ‘extra’ food is sold at local markets. 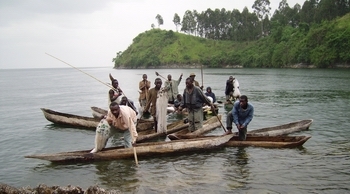 Some Pygmy family groups living on the shores of Lake Kivu have taken up fishing instead of hunting. 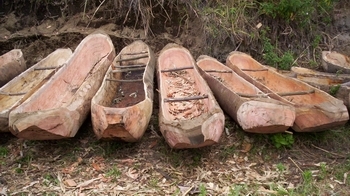 Pygmies catch their fish using small canoes made of trees trunks, the so-called pirogues. Unfortunately, the pirogues and nets are frequently stolen or destroyed during the war..
NGO reports and Batwa witnesses mention criminal robberies by policemen (! ), militias and others. They take the fishery produce, the canoes and nets from Pygmy fishermen by force. The stichting Vluchteling/ Pygmy Kleinood Project makes it possible for the Batwa to restart fishing activities on the lake: we ordered the construction of 25 pirogues and 100 fishing nets. The distribution of these materials took place in 2006. 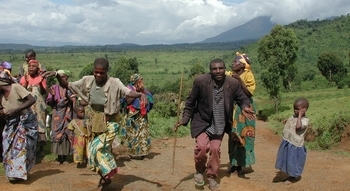 CIDOPY carried on intensive negotiations with the authorities to achieve legalisation of fishery in order to obtain official fishing licences for the different Batwa Pygmy groups. The Pygmies are fishing again! Fish is an excellent protein food resource for the Batwa Pygmies.